NASA's Solar Dynamics Observatory takes photos that are so high-resolution that not even the most advanced Ultra-HD TVs have the definition to display them in full resolution. A NASA spacecraft that constantly stares at the sun for signs of solar storms snaps images and videos so detailed that even the latest ultra-high-definition televisions can't keep up. The spacecraft, called the Solar Dynamics Observatory, is responsible for some of the most amazing photos of solar flares and other sun weather events. Its instruments record images at a whopping resolution of 4,096 by 4,096 pixels, more than four times the resolution an average HD television. 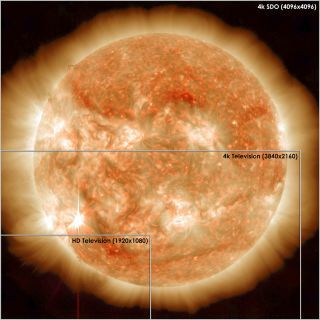 SDO sun images are even recorded in higher definition than the newly released "Ultra-HD TV" machines unveiled at the 2013 Consumer Electronics Showcase earlier this month. While Ultra-HD TVs have about four times the resolution of an average HD TV, the SDO photos are still twice as large as an Ultra-HD screen, NASA officials said in a statement. "Such detailed pictures show features on the sun that are as small as 200 miles across, helping researchers observe such things as what causes giant eruptions on the sun known as coronal mass ejections (CME) that can travel toward Earth and interfere with our satellites," they explained. While features 200 miles (322 kilometers) across sound large, the sun itself is 864,938 miles (1.3 million km) in diameter. NASA's SDO mission launched in February 2010 to record unprecedented views of the sun, solar flares and other space weather events. As of December 2012, the spacecraft had captured more than 100 million images of the sun, about the equivalent of eight hours of TV programming a day for four months, mission managers said. The SDO spacecraft is one of several space observatories keeping a constant watch on the sun. NASA's twin Stereo spacecraft and the NASA/ESA SOHO spacecraft also provide daily views of the Earth's closest star.